1. Michael Jordan, fan of surprises. Who knew? 2. 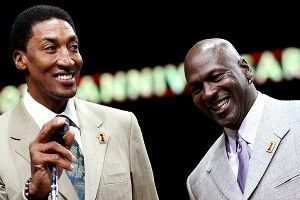 Scottie Pippen, only 47. Go figure. 3. “Chicago hot spot Sunda” sounds like one of the places Stefon would recommend to Seth Meyers as a place to take the whole family. 5. The importance drop-off from Antoine Walker to Nazr Mohammed. 6. “Dance-off” + “Jordan and Pippen” + “Trey Songz and Fabolous” = The entire reason that smartphones come standard with cameras/the Internet was created. 7. There’s not a video of this taking place, which makes me question everything I believe in, including gravity and fiscal responsibility. Should we be subjected to live in a world where this happened and we can’t watch it? NO. Should private, personal moments among friends behind closed-door settings even exist? NO. Should we be able to access a 90-minute Weezy deposition, but not watch no. 23 and no. 33 get crunk in the (312)? It’s not out today, but know that it will turn up, that is, unless MJ is holding all smartphone users present at Sunda (Nazr included) hostage in his tan-suit-filled lair beneath Lake Michigan. Then we’ll never see it. But if he’s not, then we’ll just have to wait and watch this on loop, yearning for the day when our dreams can finally come true. David Cho: This is one of my favorite NBA-related videos of all time. It goes without saying that the dancing is top-notch, and all three of them have a really good sense of body control and their movements. It’s really impressive. What, you don’t think so? Well, maybe you should try to replicate what they’re doing in the privacy of your own home and see if you can do it. You can’t, can you? You failure. Shaq is huge. Like, look at him next to LeBron and — especially — Dwight. He makes them look like so small! THESE ARE GIGANTIC DUDES. LBJ’s moves are very, “I’m only partially committed to this because giving your all to dance is what chumps do, and cool guys are more apathetic.” He can never fully commit to the dance battle. Big ups to Dwight for stepping up to the plate. The move that Shaq starts at 0:48 is sort of a weird one. He appears to rip out Dwight’s heart, eat it, then Dwight somehow poops it out, and then Shaq takes the poop, PUTS IT BACK IN HIS MOUTH, and then dances in celebration of having eaten the heart/poop thing. Not sure what’s going on up in Shaq’s brain, but seems like it might be worth looking into. Juliet Litman: Before everyone did the Dougie, all anyone did was the Soulja Boy (including me and my college roommate after we studied the instructional video for many hours). Say what you will about Baron Davis, but he was a fierce and able leader in the Soulja Boy movement. He showed commitment to the choreography during times at which he perhaps should have directed his energy elsewhere, and when the time came, he got his whole team and their fans involved. In fact, the 2007-08 Golden State Warriors may have been one of the most dance-friendly teams in the history of the NBA. Honorable mention to Al Harrington, who really nailed the Superman motion. Rembert: All commentaries aside, please find the Jordan-Pippen dance-off, Mr. Internet. The mental image I have of them doing the worm in opposite directions until both of their backs simultaneously give out, thus ending the party, will haunt me until I know whether it actually happened.